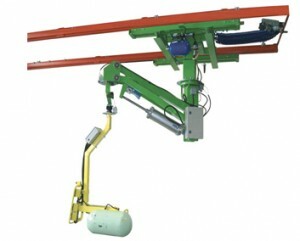 The PN series pneumatic manipulators are completely pneumatic balancers for capacity up to 250 kg including lifting tool. Different models are available: PN ERGO, PN FLEX, PN COMPATTO and PN ZIP, and different supports such as column, ceiling, overhead rails mounted. 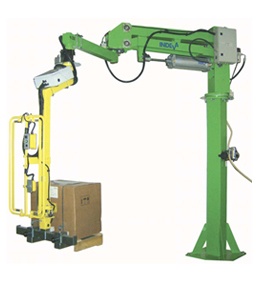 PN Series: The PN series pneumatic manipulators are completely pneumatic balancers for capacity up to 250 kg including lifting tool. Different models are available: PN ERGO, PN FLEX, PN COMPATTO and PN ZIP, and different supports such as column, ceiling, overhead rails mounted. ERGONOMIC: The specially designed position of the cylinder grants consistent load balancing along the whole vertical stroke. RELIABLE: It’s completely pneumatic logic guarantees a high level of long-term reliability and very low maintenance costs. SAFE: Equipped with safety devices that retain the grip on the load, even in case of power interruption. Special brakes keep the arm and gripping tool still when not used. VERSATILE: It can be equipped with countless types of lifting tools, mechanic or vacuum, standard or custom made.